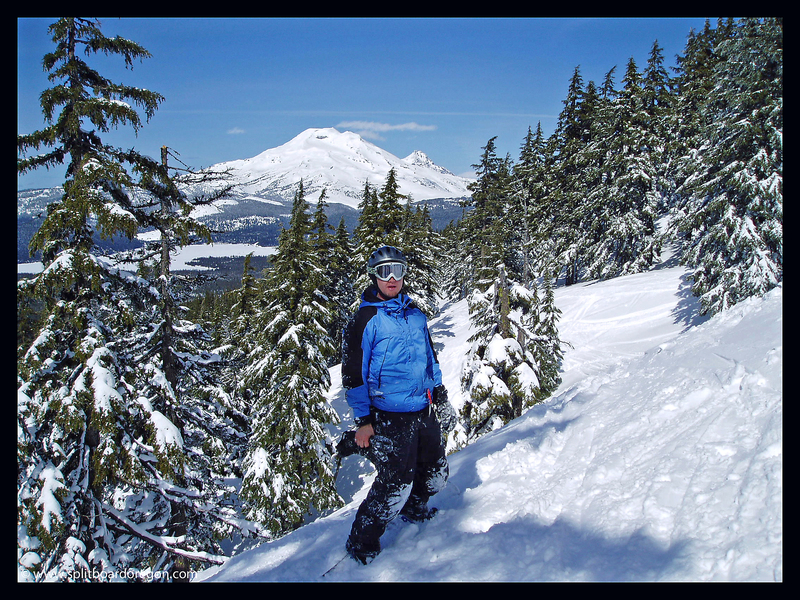 I made the long drive to Mt Bachelor from the Willamette Valley with my buddy Andy for some spring snow riding. We arrived in the parking lot to clear skies and a bit of fresh snow and knew it would be a fun day. Most of the day we spent riding off the backside of the mountain, finding numerous stashes of fresh snow in the open bowls and glades. Gotta love the long winding cat road to the Northwest Express though after riding the goods. I took some riding shots, but only retained a few after a computer crash shortly thereafter (none which were worthy of posting). 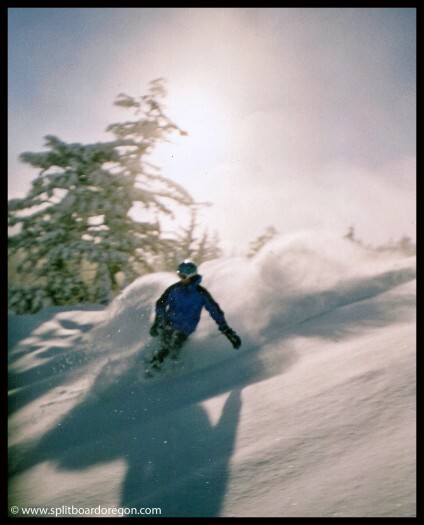 Below is a scanned shot from a point and shoot film camera of some powder turns at Bachelor from a few years earlier that kind of sums up how I remember this March day going. Needless to say, it was an excellent day of riding in the sunshine at Bachelor! Unfortunately, I lost my other photos in a computer crash, so this is the only surviving photo from the day. Overall, when you get sunshine and fresh snow at Mt. Bachelor later in the year, it’s a good place to be! Few people, lots of vertical, and good times! 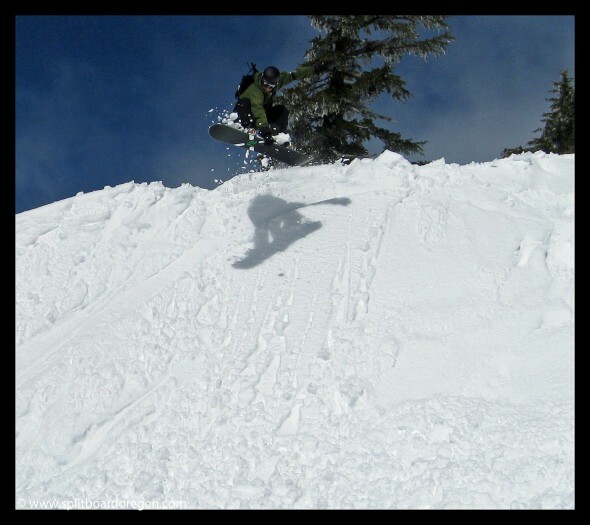 Andy and I headed over to Mt Bachelor for the day from the valley in search of some fresh snow and sunny skies. We found both. The summit chair was spinning and we spent much of our time on the mountain’s southside. The upper part of the southside was a bit crusty, but the snow down lower in the glades was excellent. The views south towards Willamette Pass were excellent, as were the views of the 3 Sisters to the northwest. Fighting the crowds of the MLK weekend was worth it for all the fresh powder that fell at Mt Bachelor over the long weekend. Bachelor’s base of 120 inches and 170 inches at mid-mountain is quite possibly the deepest snowpack in the US right now. We started off riding the Outback and Northwest chairs on Saturday. The Northwest didn’t open until about 11:00 or so, and up to that point the lift lines were pretty long. The northwest chair was pretty vacant all day long, and the snow was fantastic (about 2 feet of fresh in places). The second day I spent on the other side of the mountain on the Rainbow chair. Although slower than the high speed quads, the Rainbow had great snow and few people. The wind was pretty miserable on Sunday, and fog kept freezing onto my goggles. 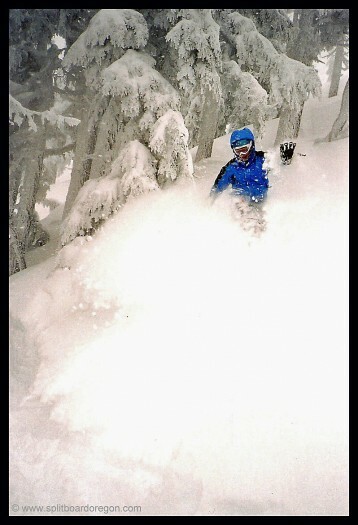 I ended up with a little wind burn on the face, but well worth the 18 inches of fresh pow. The wind had swept much of the new snow along the top of the Rainbow chair into the westerly facing slopes of the small ridges, creating some unique snow conditions. The weather cleared off after lunch and the summit view was great, though the summit lift didn’t open (high winds and avalanche danger). Looks like more of the same weather for the coming week!